What is the origin of the dog? Was he really a wolf or was he always a dog? Bedtime story or professorial paper, the FACT is, nobody knows and few agree. 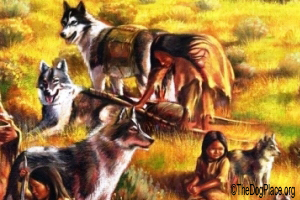 So the fact is, no one knows when wolf first met man or even if the dog is descended from the wolf. The closest we can come seems to be cave drawings and Native American lore but that was post-prehistoric. 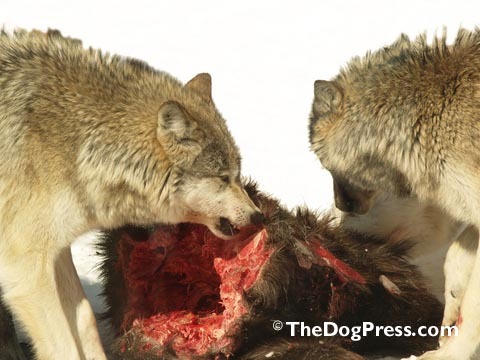 In behavioral traits, dogs and wolves are similar. Like the wolf, dogs love to dig holes. Dogs still turn around a time or two before laying down. Put those two things together and you’ve got a wolf digging a den or making a bed in the brush. We are told that’s the wolf in your dog and that “The closest living relative of the dog is the gray wolf and there is no evidence of any other canine contributing to its genetic lineage.” ~ Wikipedia. Fact always trumps fiction and in this case, the facts are indisputable. Movies and books that depict the wolf as giving up the wild for a person are fiction. You cannot domesticate the wolf. Given opportunity and the “call of the wild” he will leave you. Here’s why. The only possible prehistoric connection to the wolf is the Dire Wolf. When we look at structure and “type”, we can readily believe the genetic connection between the gray wolf and Canis dirus as shown in this skeleton. 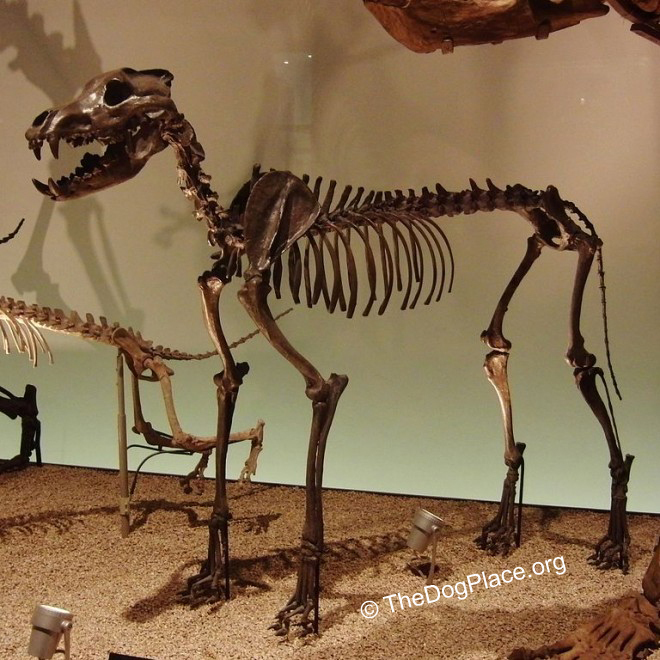 The Dire Wolf evolved in the New World and is believed to have become extinct in the Americas near the end of the Pleistocene epoch. This creature was “early” wolf but it’s still hard to believe that the Creator or evolution cut the wolf and the dog from the same DNA. Interestingly (and thankfully! ), we have not subdued the wolf as a species. Wolf remains the undisputed symbol of the wild even as his global territory shrinks and his hide is a bounty-paid trophy. When the mammoth became an elephant and the saber-toothed tiger became today’s tiger, their former forms disappeared. In that respect, the wolf is unique! The wolf has changed very little. So if in fact, the Wolf became Dog as is commonly believed, how could he have also remained himself, virtually unchanged for thousands of years while at the same time morphing into such diverse descendants? The Bison is still a bison, and the duckbilled platypus, opossum, crocodile and turtles haven’t changed in 150 million years. The FACT is, the wolf is the wolf and along with the coyote and fox, he does not domesticate. We know however that “dog” was the first domesticated species. Cat lovers might argue that but “domesticated” is the key word here. 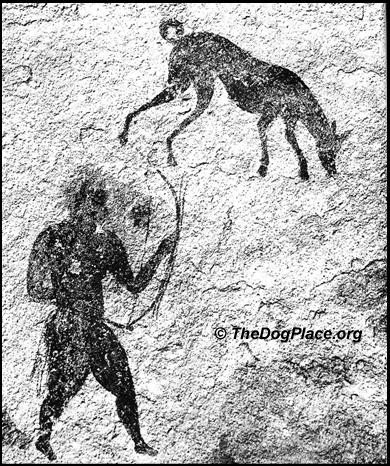 Here is irrefutable proof that the dog was the first animal to be a unique friend to early man. The “first undisputed dog remains” were found buried beside human remains 14,700 years ago, with “disputed remains occurring 36,000 years ago.” ~ Wikipedia. 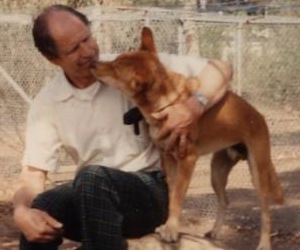 That proves a bond between the dog and mankind that is unequalled in the animal kingdom and unrivaled in human history. But there’s more genetic mystery that remains without answer. While theories abound, who can explain how dog, unlike any species on earth, evolved into so many different sizes and coat types and behavioral characteristics? A rodent may take different forms but he remains a “rat” and a bird may be as little as a sparrow or as large as an eagle but it is still a bird and instinctively fears man. Leave your horse unfenced and unfed and he will be off to greener pastures. Ditto your cat. And most significant, the dog is the only species that has no inborn fear of man. Scientists can “tame” a wolf but only if they confine it. The dog will stay with you through sickness, deadly threat or starvation. If you can name another animal that will do that or if you have thoughts about where dog might have come from, email the editor and we may include your comment in a follow-up edition. Let us hope that the wolf and the bald eagle remain unchanged as symbols of American freedom. In the meantime, the dog stands alone, a unique animal science cannot explain but unchallenged as Man’s Best Friend. What happens when a dog is crossed with a wolf? All mystique is lost.